More favorable for path adjustment. 4.0, 5.5, 7.0, 9.0mm for your convenience. 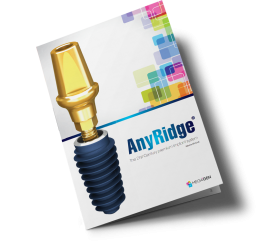 1mm trimmable margin gives restorative flexibility without chnging B-L dimension. Biologic S-line provides seamless natural-looking emergence profile. - Wider diameter has more taper. Abutment can be used on any sizes of fixture. Important for esthetics and long-term prognosis. Easy to place and always guarantee excellent initial stability. - No wobbling on cortical slope in the case of anterior immediate placement. Bigger fixture through smaller osteotomy socket (Less invasive surgery). Important to preserve the biology of marginal hard and soft tissues. Scarica il catalogo completo AnyRidge per tutte le specifiche tecniche di prodotto.